Children seem to be wired to pay special notice to non-human creatures. Puppies and big furry things are usually favored. Kids’ sense of wonder can be cultivated rather easily, to extend to tiny bugs and, especially, birds. Birds are easy to notice because of their activity and variety in size, color and shape. Even city kids can open a window to the natural world as they observe the pigeons and sparrows. At seven years of age, our oldest grandchild, Justin, very quickly learned to distinguish crows from ravens when he visited us in New Mexico. He noticed differences in calls and in tail and bill shape, and the way that ravens soared on outstretched wings while their smaller cousins “rowed” laboriously across the sky. Our next grandchild, Kenneth, also started young. 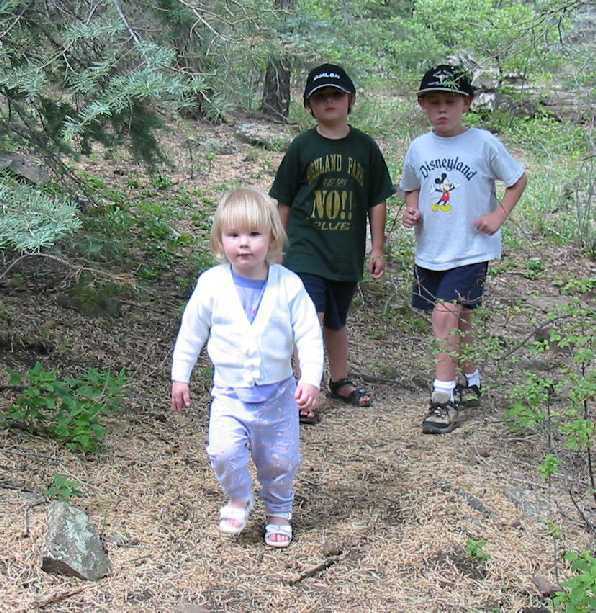 He is shown (above) walking with Grandpa on a bird walk in the Sandia Mountains, and also with two of his younger siblings, Glen and Mary, walking in Cibola National Forest, looking for signs of bear. All three children are very adept at finding deer, porcupines and eagles when they visit Buffalo Lake National Wildlife Refuge near their home. Kenneth really surprised us one day when we were visiting with his family in Canyon, Texas. We were driving along the golf course. His younger brother, Glen, pointed out a big anvil-headed thunderstorm cloud. We told Glen that he was a very good storm spotter, an important skill in Tornado Alley. The younger grandchildren are following the same path. Two year old Graciela (see this earlier post about her) knows how to use binoculars, and her little sister Carina is already pointing out the birds in the back yard feeder. This photo shows Graciela checking out some sparrows in the tree above her. Elizabeth, our youngest, has just turned one. With exposure to the enthusiasm of her siblings and parents she is sure to become another wildlife watcher! For some great tips about getting kids started in bird watching, check out this link. September 2nd, 2011 at 10:49 pm Totaly love this!